Cusp of Normal: What do we want? EQUAL RIGHTS! When do we want them? NOW! What do we want? EQUAL RIGHTS! When do we want them? NOW! Last Saturday was my first protest. 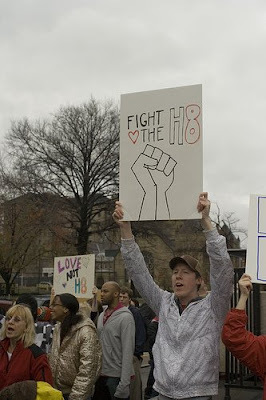 Andrew and I took to the streets of the Oakland neighborhood of Pittsburgh to show our support for the overturning of proposition 8. I wasn't sure if there would be a large crowd, but I was pleased to hear a total of 450 people attended. Now 450 people might not sound like much compared to the crowds that flocked to protests in Chicago and cities around California, but remember Pittsburgh is a small town with a big city complex. Because it was raining and I wanted to travel as lightly as possible, I didn't bring a camera to the protest. The photos below were borrowed from bombnomnom's Flickr. I didn't ask for permission to use these photos on my blog because I could not find a way to contact him and I am probably the only person left on the planet without a flickr account. 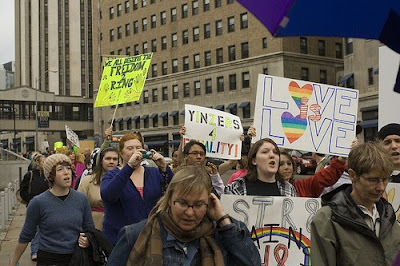 For more photos of the Pittsburgh protest, go here. To my knowledge, only one mainstream Pittsburgh news outlet covered the event, but I guess one is better than none. If you wanted to take part in the protest but couldn't for any reason, you have a second chance. The next national protest will take place January 10. Find out more on jointheimpact.com. Again, I want to thank Rachel for telling me about the protest. This is why I love our blogging community so much. We really can make a difference. Speaking of making a difference, have you donated to Rachel's fundraiser for lupus yet? Anything you can afford to contribute brings her one step closer to her goal. Did you guys make your own signs? Random question I know, they just look very well done in the pics. I am so jealous! I feel like most people around here (St. Louis) have already moved on and forgotten about it. Makes me so frustrated! January 10th you say? I'm there! (Side note, the word verification is "reeprop" - even then agree that we should revoke prop 8! So great you were involved! And you were such a trooper out there in the rain! You rock!! Thanks for the link to jointheimpact.com. So glad you went! Being in the military, I'm somewhat limited in the protesting I can do, thus I'm stuck behind the scenes and spreading awareness, but I'm so glady you got the chance to go protest! I look so militant. And very attractive. I wonder if by the time gay marriage is accepted as a reality advances in cloning will have developed to the point that Proposition 8.1 may very well deal with the ethics of allowing a person to wed his/her clone. All I'm saying is that I would totally do me. Thank you so much for the shout out!!!! Once again I am thrilled that you went to your protest. Every person can make a difference! Haha, those are my photos!